If you have a yearning for egg free pancakes, look no further. This is an easy recipe that produces excellent results every time. Just be sure to allow a little time for the batter to stand. The longer it stands the better your pancakes will be. Combine the dry ingredients and mix. Then add the milk, oil, water, and vanilla. Do not over mix, you actually want it to be slightly lumpy. Set the mixture aside to rest for a few minutes. Heat a large skillet or heavy-based frying pan over a medium-high heat, until hot. While the pan is still heating, add the butter. As soon as the butter is melted, add melted butter to pancake batter and stir it in. When the pan is hot enough, wipe a little butter around the pan and pour ¼ cup of batter into skillet for each pancake. Cook them until bubbles form on the surface, then flip them over, and cook until the 2nd side is golden brown. Add fruit or jam to finish off this tasty snack. 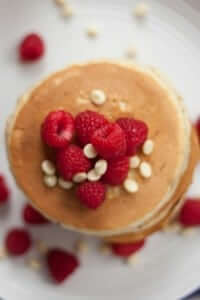 We have several more eggless pancake recipes available, so please take a look. You can thin this batter down by adding more liquid and use it to make crepes. These can be stacked with a piece of baking parchment between each one and frozen for later use. Thin crepes are an excellent alternative to lasagne pasta or cannelloni.